The Ernst Kirchweger Haus (EKH) was squatted as a social centre in 1990 and legalised in 2008. Nowadays from time to time empty buildings are squatted and in the most instances given up after negotiations with the authorities. There are some exceptions like in 2014, when about 1,500 riot police officers, a tank-like police vehicle, a police water cannon and helicopters have been used to clear a building occupied by the group "Pizzaria Anarchia" in the Austrian capital Vienna. In Italy, squatting has no legal basis, but there are many squats used as social centres. The first occupations of abandoned buildings began in 1968 with the left-wing movements Lotta Continua and Potere Operaio. Out of the breakup of these two movements was born Autonomia Operaia, which was composed of a Marxist–Leninist and Maoist wing and also an anarchist and more libertarian one. These squats had Marxist-Leninist (but also Stalinist and Maoist) ideals and came from the left wing of Autonomia. The militants of the Italian armed struggle (the New Red Brigades) were connected to these squats. There are many left-wing self-organised occupied projects across Italy such as Cascina Torchiera in Milan and Forte Prenestino in Rome. There are also far-right social centres such as CasaPound. The Dutch use the term krakers to refer to people who squat houses with the aim of living in them (as opposed to people who break into buildings for the purpose of vandalism or theft). Squatting was criminalised in 2010. In the past, squats sometimes went through a process of legalisation. This is the case with the Poortgebouw in Rotterdam, which was squatted in 1980. In 1982, the inhabitants agreed to pay rent to the city council. The ORKZ (nl:Oude Rooms Katholieke Ziekenhuis) in Groningen, squatted in 1979, is an old Roman Catholic hospital, which was declared legal in the 1980s. In Amsterdam, OCCII, OT301 and Vrankrijk are examples of legalised spaces. The Grote Broek in Nijmegen was squatted in 1984 and legalised in the 2000s. 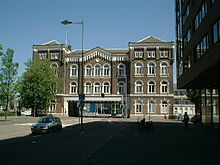 The Vrijplaats Koppenhinksteeg in Leiden was occupied in 1968 and eventually evicted in 2010. There are also squats which refuse to legalise such as Anarres in Dordrecht (evicted in 2009), De Blauwe Aanslag in The Hague (evicted 2003), Het Slaakhuis (evicted) in Rotterdam, ADM (evicted) in Amsterdam and the Landbouwbelang and Villa Vendex in Maastricht. 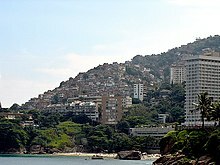 In São Paulo the largest favela is Heliópolis, with over 200,000 inhabitants. However, its occupied area has been officially recognized as a regular neighborhood of the city. There are also a number of squatter buildings in the inner city, the most famous of which was a 22-story building called Prestes Maia, whose inhabitants were finally evicted by the police in 2007 after a long conflict with the city administration. Inspired both by this movement and increasing property speculation and gentrification, various occupations in buildings and unoccupied areas in big cities, led by groups such as the Homeless Workers' Movement (MTST) or Downtown Roofless Movement (MSTC). The former Hotel Santos Dumont on Mauá Street in the Luz neighbourhood was occupied in 2007 after being derelict for 17 years. An estimated 1000 people were living in the building, paying a small amount every month to cover maintenance. The community expels people who fight, use drugs or abuse alcohol. There are also rural squatter movements in Brazil, such as the Landless Workers' Movement (MST), which has an estimated 1.5 million members. 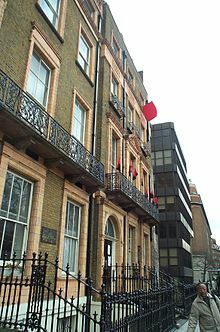 In Europe, it is common for buildings to be squatted to be used as social centres. 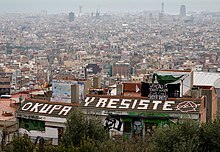 Cafés, bars, libraries, free shops, swaps shops and gyms have all been created, with many squats also holding parties and concerts. Social centers are often a combination of many things that happen in one space with the aim of creating a space for people to meet in a non-commercial setting, whether it be for a party, political workshop, to see a film, have a drink or have breakfast. There are many squatted social centers around the world, but they exist mainly in countries where squatting is legal. Examples include Ernst-Kirchweger-Haus in Austria, the RampART Social Centre in England, OT301 in the Netherlands and Ungdomshuset in Denmark (evicted on March 1, 2007, and demolished four days later). ^ Fulton, Catharine (April 15, 2009). ""Allir á Vatnsstíg, löggan er komin"". Reykjavík Grapevine. Retrieved 13 April 2019. ^ Phillips, Tom (23 January 2006). "Brazil's roofless reclaim the cities". Guardian. Retrieved 14 April 2019. ^ Phillips, Dom (30 September 2017). "Driven by poverty, squatters occupied a derelict São Paulo hotel. Now they face eviction". Guardian. Retrieved 14 April 2019.